Here is the final installment of my time in Prague! If you haven’t read about the first 2 days, for part 1, CLICK HERE, and for part 2, CLICK HERE. Ready to get started? So am I.
I decided to get a bit of a later start today, as I had nothing planned and, to be honest, the whole traveling from city to city so quickly was wearing me out. So I decided to take it easy today. 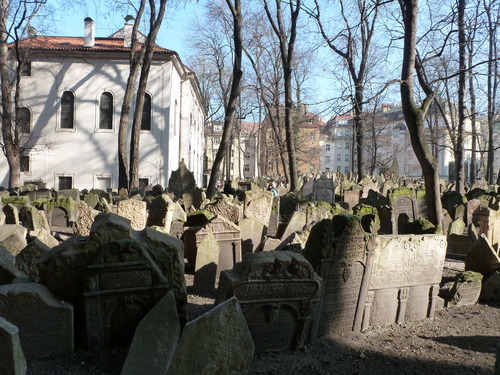 One thing I really wanted to check out was the Old Jewish Quarter of Prague. I knew the city was very rich in Jewish history and that it was something I felt I needed to see. I bought my ticket and headed to see as much as I could. Unfortunately, there was no photography allowed inside of any buildings, but it was really a meaningful experience to see everything. I explored around the quarter and the synagogues for maybe an hour and a half. I then decided to just wander around the city. I happened upon some cool things! I started to get a little cold so I headed back to the hostel to relax and warm up. There was a new girl in the room, and she was planning on taking the free walking tour that the hostel provided. I decided to join her, since it was my last night there. On the tour were just 2 other guys, one of whom was from California. Honza, my guide from the segway tour, lead us around Prague and he still was unable to pronounce my name. It’s not that hard, I swear! The statue in front of the Kafka museum. Yes, it’s two guys peeing, and their hips rotate back and forth. Because why not? Neon penguins! Again, why not? Lennon Wall, again. Apparently it is constantly painted over. Most things don’t stay up for more than a few months, but the higher up you can paint, the longer it stays! We walked around the city for about an hour before heading back to the hostel. I was thinking about doing a pub crawl, but really wasn’t feeling up to it. I ended up staying and talking with the guy from California, who’s name was Kameron. He is a music producer, and has been traveling and working in Europe for the past few months. We had such a great conversation for hours, and then realized we were both starving! We headed to a nearby restaurant and pub. I got a traditional Czech sausage and a large cider. We ate and talked until about 1am, and it was such a great time! Such a fun way to end my time in Prague. So there you go! That was my time in Prague! I wish I’d had one more day, particularly to check out the Prague Castle. I also wish it hadn’t been so cold! But I’m sure I’ll make it back there eventually. Next stop: Vienna!